I figured today's WOD was going to pretty hard but I eased up on the weights since I tend to tilt forwards on front squats and it wasn't so bad, but we will see what my legs tell me by evening time! I only did 55 lbs because I think my max front squat is ~110 lbs and for 75 reps, 50% of my 1 rep max would be doable and not leave me handicapped for the rest of the weekend. I was able to do 32 reps without stopping then I put the bar down before doing another 9 reps, rest, and then the final 9 reps. I had to convince BC to drop the weight (we all want to Rx the weights!) and he went for 115 lbs and that was still tough for him! Still I prefer the WODs that use barbells, I feel like I'm getting a harder workout and not just light cardio. 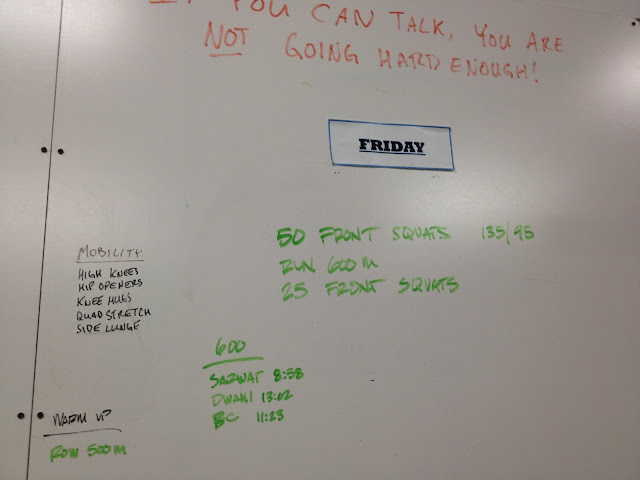 The push presses were harder today- I could definitely feel the hurt from the front squats! That was all for this morning, I'm aiming to get a good bike ride in today and possibly even a run. So glad it's Friday!